Home / Everest Academy - Everest Collegiate High School - Everest Staff - Everest Academy Student Life - Everest Collegiate High School Student Life / Why the Gold Shirts? Gold shirts can be found on every corner of campus every Wednesday during the month of October. Why? 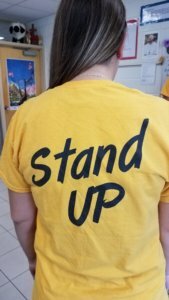 To highlight our golden rule anti-bullying campaign, encouraging students to “stand up” and promote a positive culture on campus. Our faculty and staff all wear their t-shirts on each Wednesday of the month as a visual reminder of the focus for the month. This month’s virtue for preschool through fifth grade is respect. The virtue for middle school and high school is purity: a path of true love. Both virtues connect well with the anti-bullying campaign, since both are about seeing the dignity of the other person. 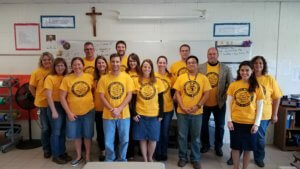 Every classroom will receive a visit from our deans of students for a presentation on our golden rule campaign: “Let the Christ in you find the Christ in others”.